Anytime I hear about a shop that opened in the 昭和 (Showa era 1926 - 1989), I have to try it. Satsuki is 昭和23, aka 1948. Fantastic. From father to son, this is a local legend of a shop. Autographs from famous people of yesteryear, yellowing in the shop. And an amazing bowl of chukasoba. Wow, wow, wow. With newer shops going all out in the ingredients department, it is still good to eat a classic bowl like this. 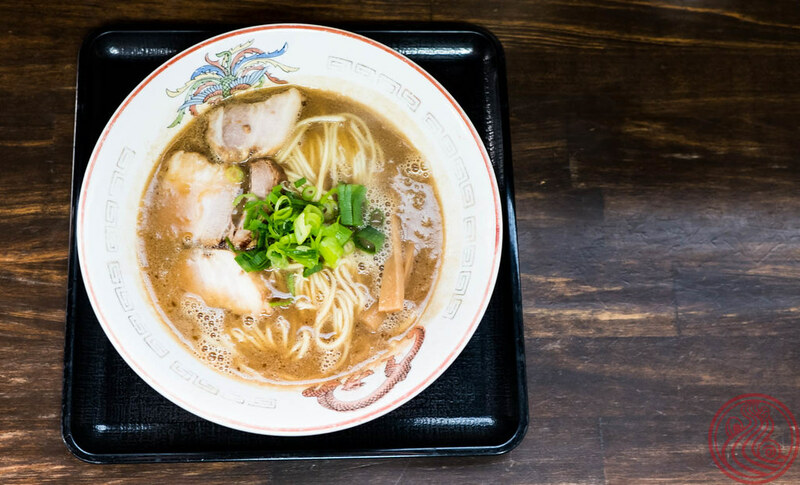 Ramen has definitely become gourmet, especially in Tokyo, but the roots are in inexpensive comfort food, often made from bone scraps and cheap rationed wheat flour. 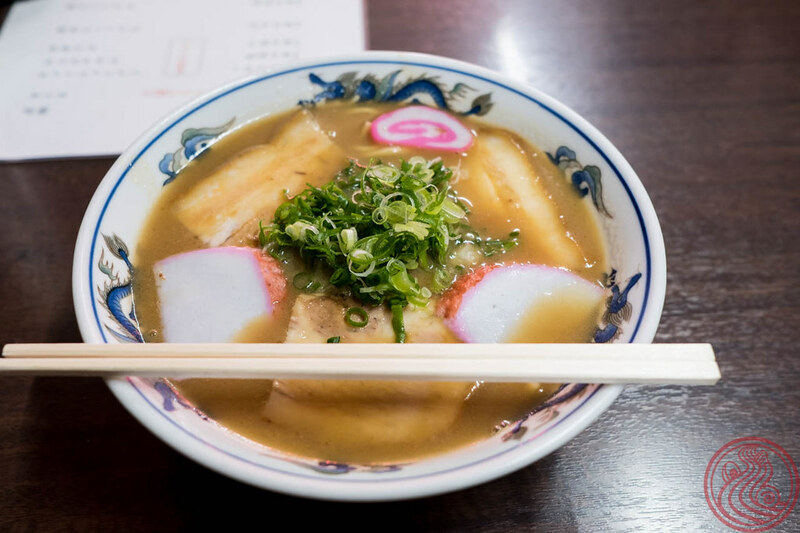 Slurping a bowl like this helps us understand why ramen became a staple food in Japan. 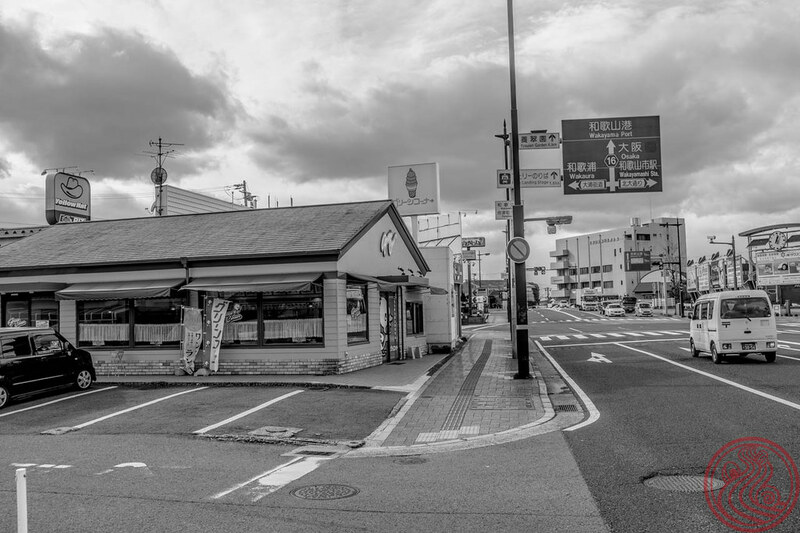 Looking back at my personal ramen journey, I was surprised to see that this shop was only a few minutes walk from the company dormitory that I stayed at when I first arrived in Japan more than 11 years ago. At the time, our boss recommended a terrible 180 yen ramen place next to the station. I slurped with my new coworkers, and no one really enjoyed it. It took a few years before I had a bowl I really loved. If he had told me about this spot, my ramen adventures would have started much earlier. The locals know what's up! Where do I begin with this shop. How about the location. You might have a little difficulty, as the shop is in a residential neighborhood. This shop is actually in the master's house. Luckily, Japanese zoning laws are not very strict, and something like this is ok.
How this happened is an interesting story. This is 川名さん, Mr. Kawana. He opened Kioritei as a bento shop back in 1991. Bento shops serve up boxed lunches, and there are many of them around Tokyo to feed the salaryman who doesn't have time to go to a restaurant, or maybe doesn't want to spend the big bucks. I often visit a local bento shop that sells an entire lunch for 200 yen. Less than $2. 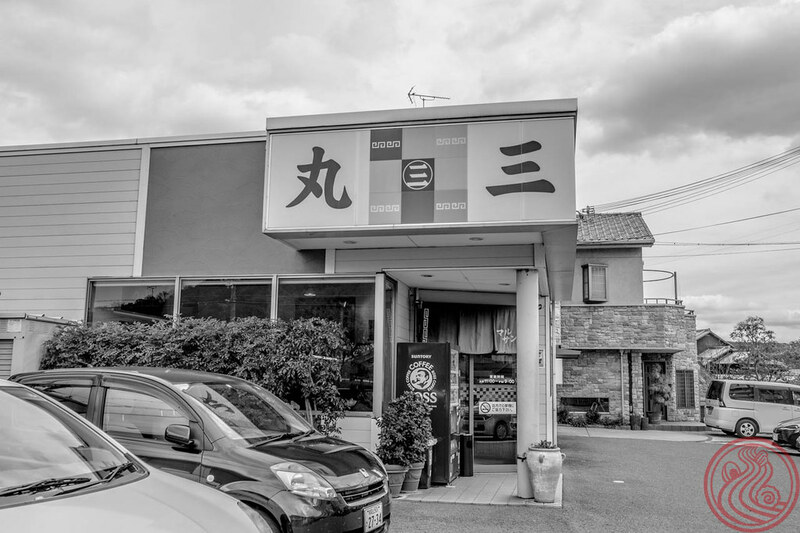 In 2000, the Kioritei bento shop started serving homemade ramen in the evening, as well as continuing the bento lunches. He further expanded in 2006 with a 2nd floor bar. Eventually it all ended in 2014. I never tried any of these spots, unfortunately. Lucky for me, in 2016 the fans convinced Kawana-san to reopen. 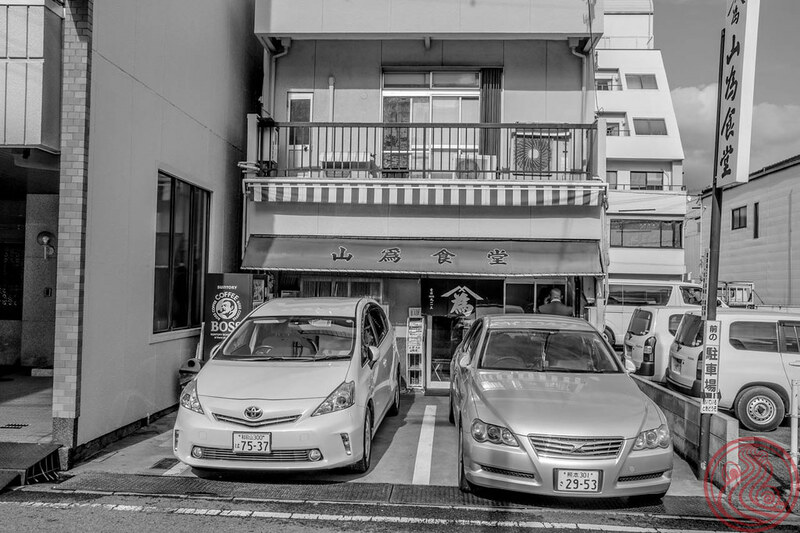 He couldn't handle commuting to a shop everyday, so instead they took to a Japanese crowdfunding site to get the money to reform their own home into a shop. Over 90 people stepped up to hit the goal of $20,000, and in March of 2017, the new shop was ready to go. The menu is always changing, and at dinner time it is an entire course. Appetizer, three kinds of ramen, an egg course, and dessert. Shimane Prefecture soy sauce, handmade noodles, and eggplant for the first ramen course. As there are not many people served each day, the master used a hand-crank pasta machine to make the noodles on the spot. 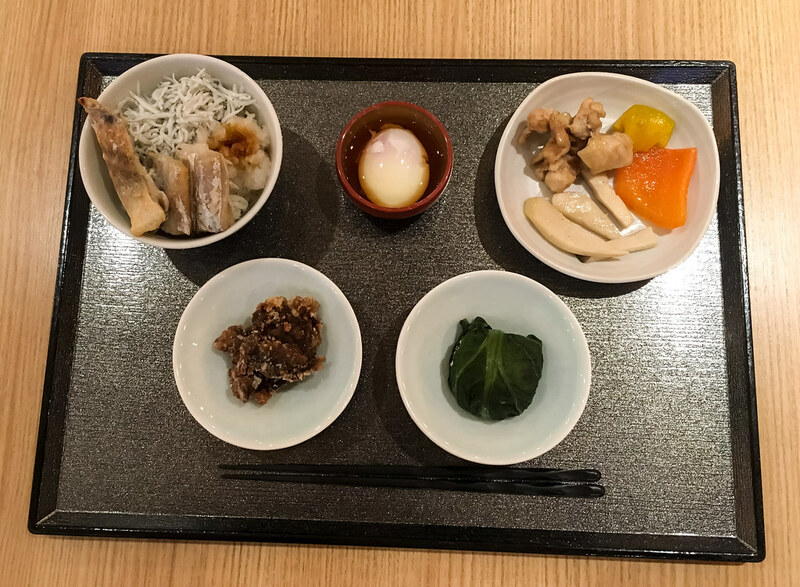 For an extra 1000 yen (the regular course is 3800 yen) you can have a meat dish. Japanese wagyu steak. A ramen egg served on rice. This is a specialty egg from Ibaraki Prefecture. Every main ingredient is very carefully chosen at Kioritei. 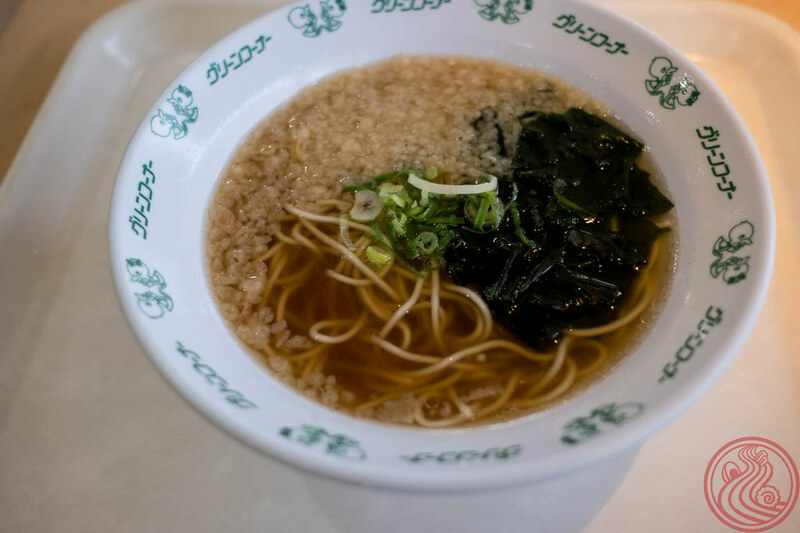 A small bowl of shio ramen uses Okinawan natural salt. The final ramen dish was a cold noodle served in a walnut sauce. Akihabara's latest is Shinada, but the full name of this spot is kujukurin niboshi tsukemen shinada. Formerly Tanaka Second, one of my favorite shops. Raaaaaaaaaammmmmmmmmmmeeeeeeennnnn! As my days with #TokyoExtra are finished, I guess it is ok for this ramen to be as well. The shop's name now includes kujukurinhama, the famous beach on the east side of Chiba. 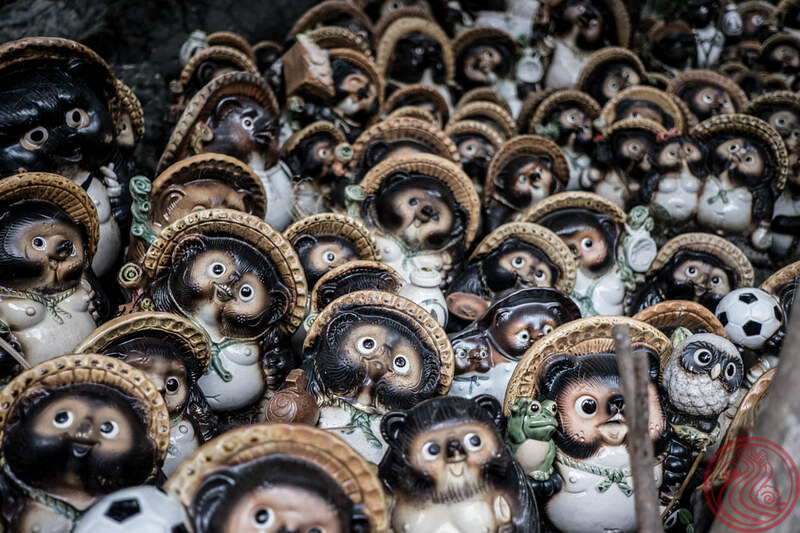 This part of Japan is very famous for niboshi, dried sardines. Although these dried sardines make their way into many styles of ramen, nothing utilizes them more than a bowl of thick tsukemen. Two styles. The above 純濃煮干しつけ麺 thick soup and the below 淡麗塩煮干しつけ麺 thin soup. Choose either. Better yet, go with a friend and get both. The differences are not just in the soup, but in the presentation of the noodles. The thinner soup means noodles served in konbusui, a light broth made from Japanese kelp. It is a little bit slimy, and has some of the most intense umami flavors you can experience. At first I was upset that I will never have that clear bowl of abalone and spiny lobster ramen again, but I was told that it will sometimes appear as a limited slurp. Regardless of whether or not it is available, this tsukemen is a huge winner. I've been to Wakayama a few times. I work there on occasion, and the city is a gateway to the Kii Peninsula, an amazing place for motorcycle touring. My ramen adventures, though, have been lacking. I visited the famous Ide Shoten before, as well as the shop that is constantly in the top 3 for national rankings, Seino. 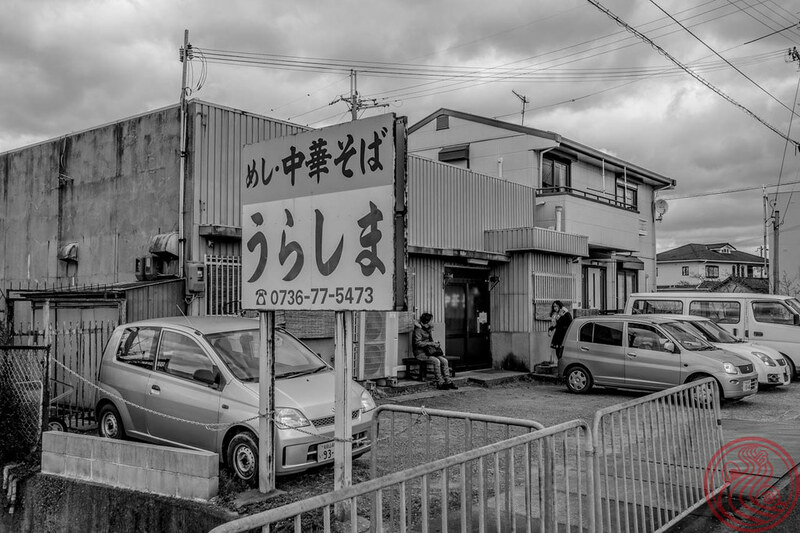 But the city of Wakayama has a legitimate ramen scene. I just needed a guide. I was told to wait at Wakayama-shi station, which was completely under construction. Then my guide showed up. 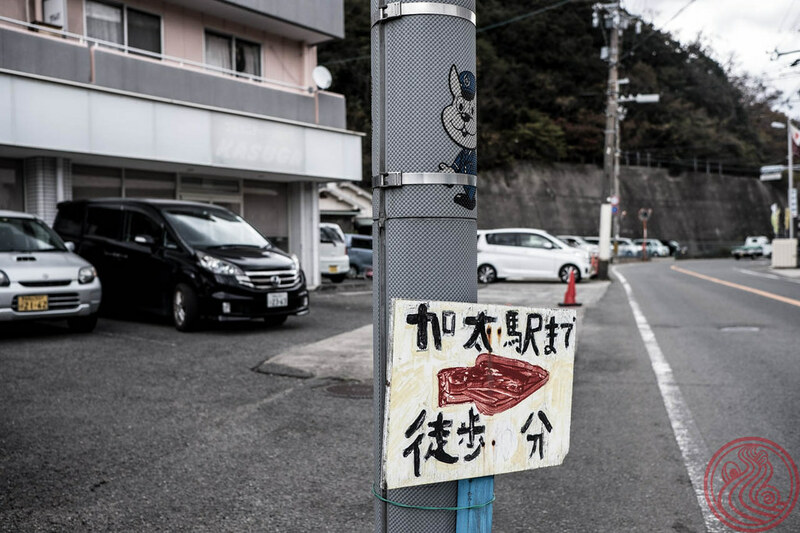 For those who can't read the sign, 和歌山ラーメンタクシー says Wakayama Ramen Taxi. 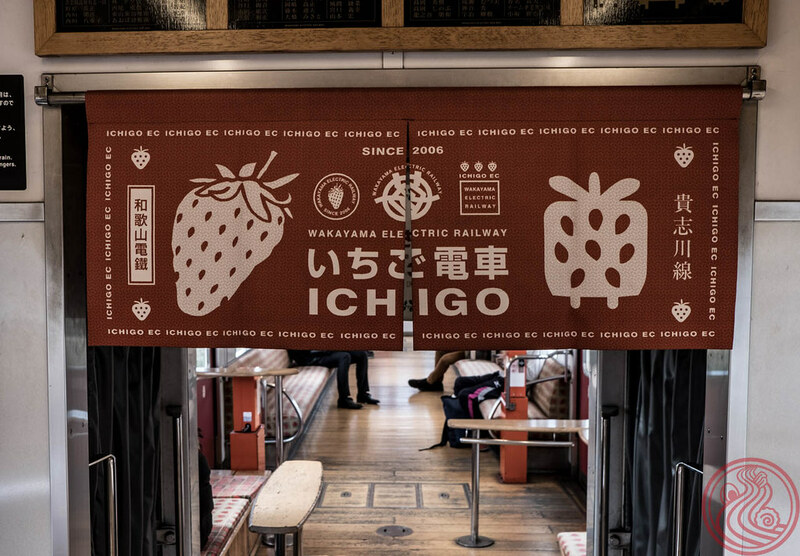 This service was created recently to promote tourism (and ramen) in the area. 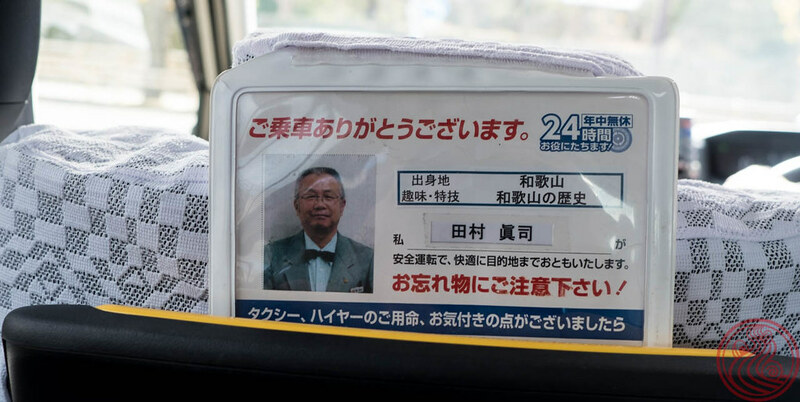 Select taxi drivers must pass an exam on local ramen and history. Only those who get a high enough score are deemed worthy of the title. Today, my personal ramen chauffeur would be Mr. Tamura. His hometown is Wakayama and his area of expertise is local history. He wanted to take me to Ide Shoten, but I explained that I was no rookie to the local scene. Let's go with Plan B. He asked me if I could handle something intense and heavy. Just what I needed. He set the bar very high on this one. 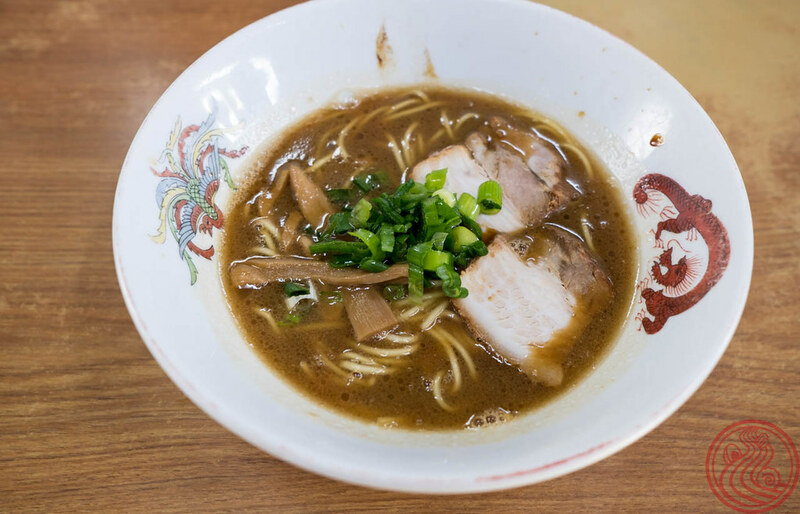 Wakayama-style ramen is characterized by a thick pork soup and a strong shoyu tare. 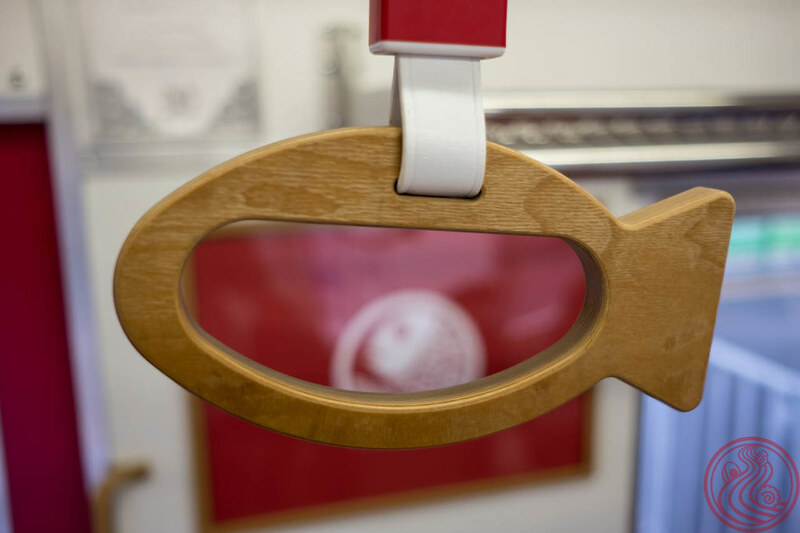 The area is historically one of Japan's most well-known soy sauce producing regions, so it makes sense that their local style would capitalize on that. The pork here was thick cut and completely melted in my mouth. I had to eat some pieces with a spoon. Decadent. Mr. Tamura waited for me outside, and for the second shop, I requested somewhere that serves a side of 早すし, pressed sushi that is available on your tabletop. Just grab and eat as many as you like! Marusan was a bit of a drive, but it was a good break to digest and chat with the driver. This shop is actually his personal favorite. The soup is, again, thick pork, but it has been cooked with extra ホルモン, offal, for a heartier, but not heavier flavor. 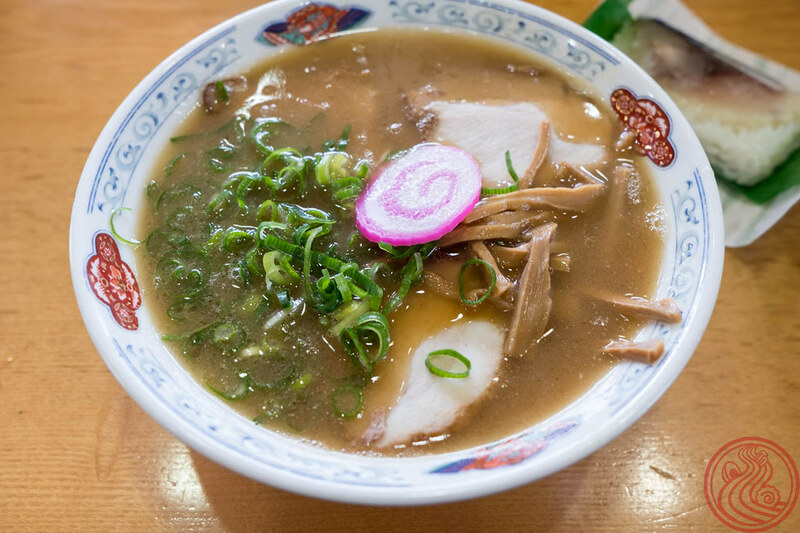 Many ramen shops in the area have 丸, maru, in the name. 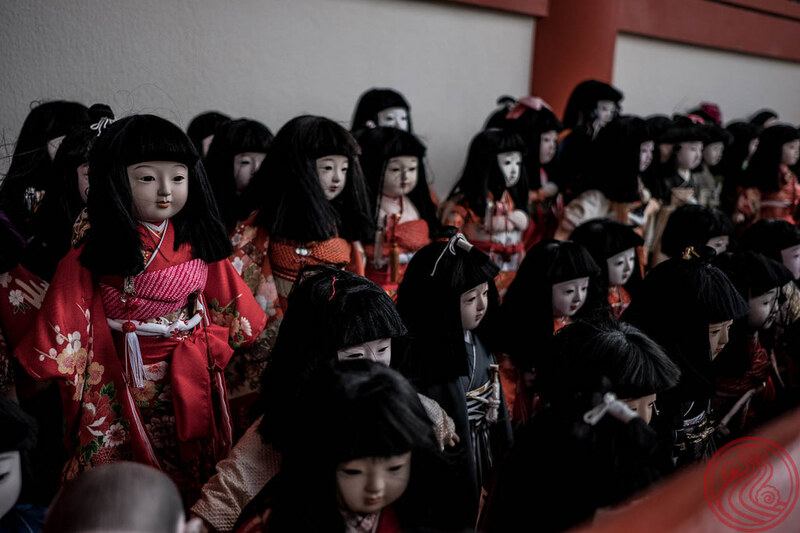 This is a Wakayama thing, paying homage to some of the area's early chukasoba shops. And, yes, this one had tabletop sushi to snack on (though the ramen only took a couple minutes to arrive). I was definitely full, but figured I could crush another bowl. Mr. Tamura said I should go light this time. Yes! Cute shop! Green Corner is almost like a truck stop diner. 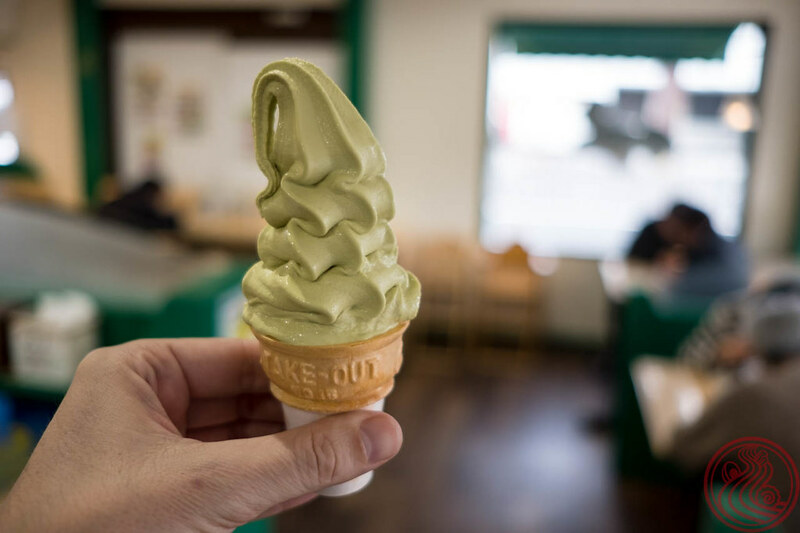 They serve a few staples like ramen, fried rice, fried pork cutlets, and ice cream. Bonus, a mini bowl of ramen is only 206 yen. That's less than $2. Super glad not to have to crush another heavy bowl. And that price! I paid more for the ice cream. This was a total working class ramen shop. I met a local Osakan, a car mechanic by day and competitive DJ at night, who was here for a quick lunch. See you soon DJ JB! From there, we went back to Wakayama-shi. Our entire tour was about an hour and a half. On weekends the lines may have been much, much longer, so you could probably do 2 hours. 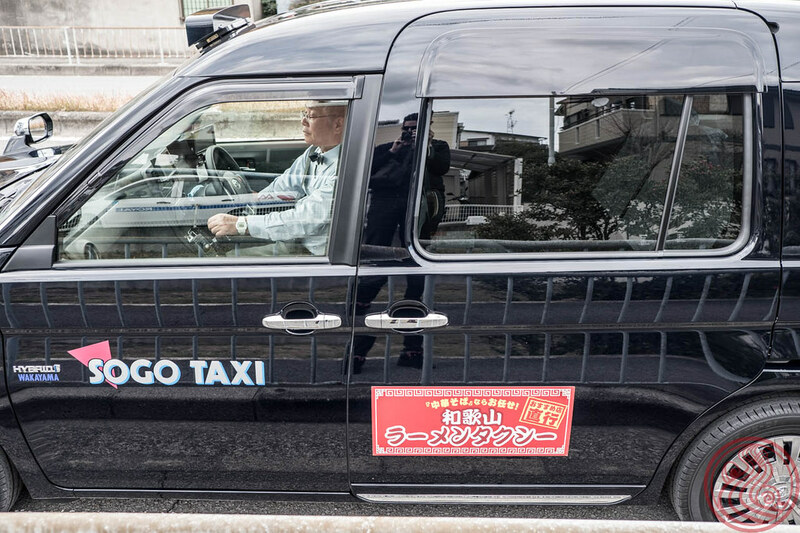 If you are curious about the price, the Wakayama Ramen Taxi coasts 4000 yen an hour. Very reasonable, especially if you go with friends. For booking, contact the Wakayama tourism center. To be honest, all I wanted at this time was to check into my hotel, dip in the hot spring, and take a nap. But I timed it all wrong, and still had about 2 hours to kill. From Wakayama-shi station, you can go to Kada, a sleepy little town on the coast with a famous shrine. Why not! Randomly, I got to ride this little train. 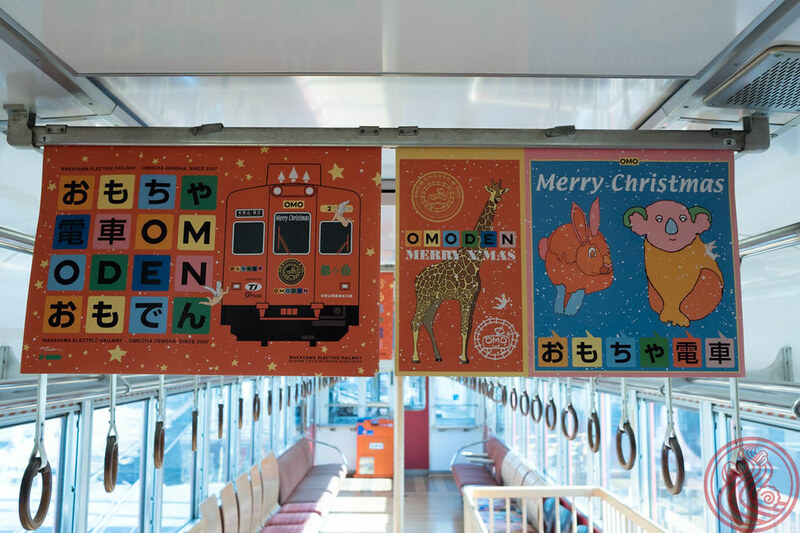 It's the めでたいでんしゃ, a train modeled after a sea bream fish. 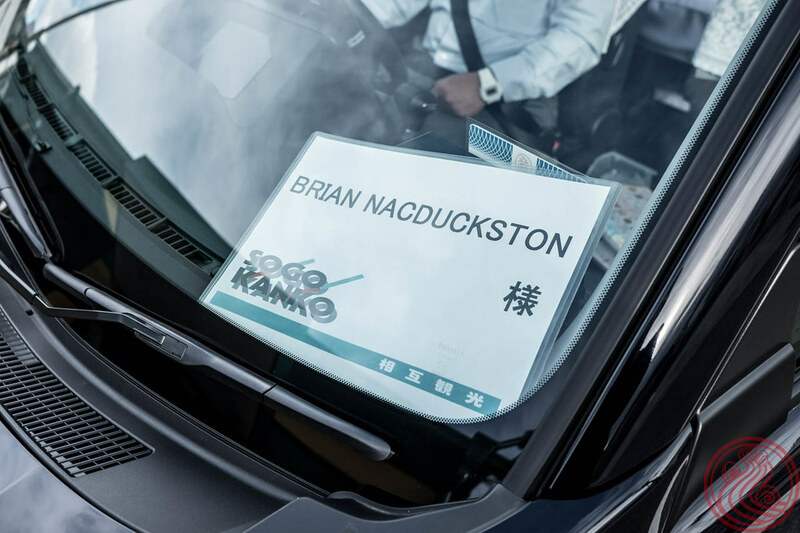 Attention to detail throughout. It turns out that this is another Wakayama thing; custom trains. More on that later. Kada was super quite on a Tuesday afternoon in December. The area has some beaches as well, but no one in their right mind would touch the water this time of year. Beautiful though. You can take a ferry out to the islands, Okinoshima and Jinnoshima, if you want. Back to town, to my hotel for a hot spring and nap. Just another note about Kada. Even though it can seem a bit sleepy, it looks like a great place to stay. There are at least four onsen ryokan (Japanese inns with hot springs) in the area. They all have views of the sea, and probably some amazing seafood dinners. 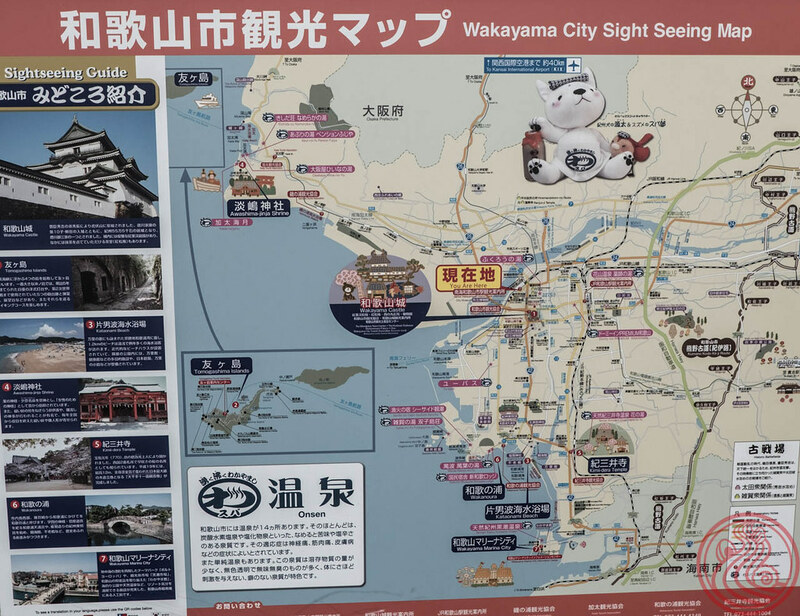 For a list of spots to stay in Wakayama, check out My Secret Wakayama, a tourism portal dedicated to this city. I stayed at the Wakayama Dormy Inn. Dormy Inn is a nationwide chain of business hotels, many of which have hot springs. I've actually stayed at a few for work, and they are really nice. So nice, in fact, that I had a bit of a problem. My plan was to check in around 4pm, take a quick bath, and take a nap for a couple hours before heading off for some local sake and food. 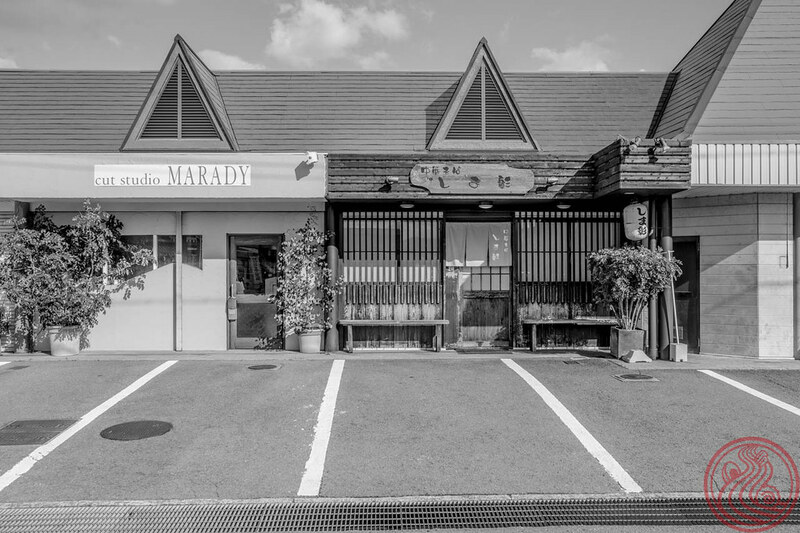 I even found this great writeup of local izakayas. A little jizake (local sake) and a little jizakana (local fish). Nothing too crazy, and then back to the hotel for another soak in the onsen and a full night's rest. But I was more tired than I thought (I flew at 7:00am that morning) and the hot springs plus two and a half bowls of ramen knocked me out. I slept until 4:30am the next day. That's life! At least I was up in time for a tasty breakfast of local Wakayama specialties at the Dormy Inn. 太刀魚 - Hairtail, a kind of fish caught locally. Labeled at the restaurant as Splinter Fish, though I can't ind any info about it. Japanese fish often don't have common names in English. This one was very soft and was great over rice. 紀州うめどり - Local chicken raised on a diet of pickled plum. This special feed is meant to make the meat more tender. 鯨の竜田揚げ - Whale meat braised in soy sauce and deep fried. Wakayama and the surrounding waters still have a strong connection to whaling. めはり寿司 - Seasoned rice balls wrapped in mustard leaf. I usually don't eat before noon, but I couldn't pass this up. While I was grateful for the suggestions from the taxi driver the day before, I had a few ramen shops on my personal list to hit this time around. 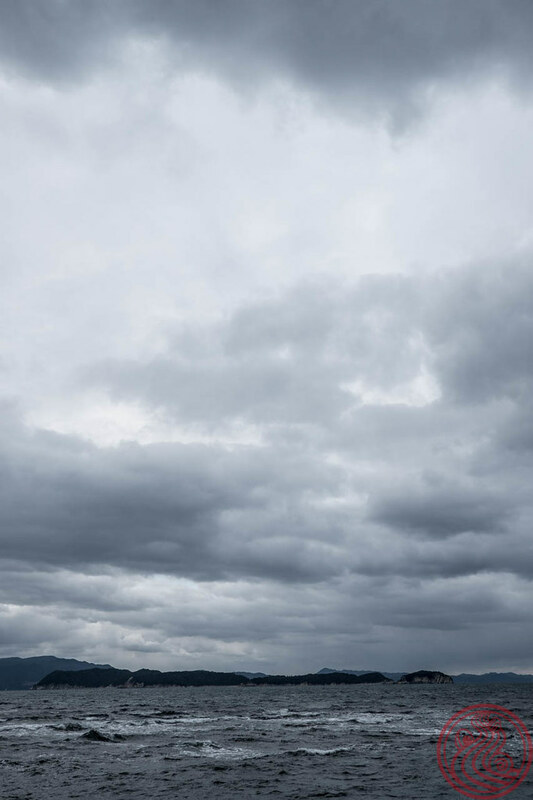 Both were to the east of Wakayama City. The JR Wakayama line snakes up the center of the peninsula towards Nara. Luckily Uchita Station was just about 20 minutes away. Followed by a short walk. I arrived about 15 minutes before they opened and already there were a dozen people waiting. On a Wednesday. I should also mention that this shop is only open for 2 hours a day. Only true ramen nerds feel joy when we hear something like that. A solid bowl, again in the thick Wakayama style. Again an amazing treat. 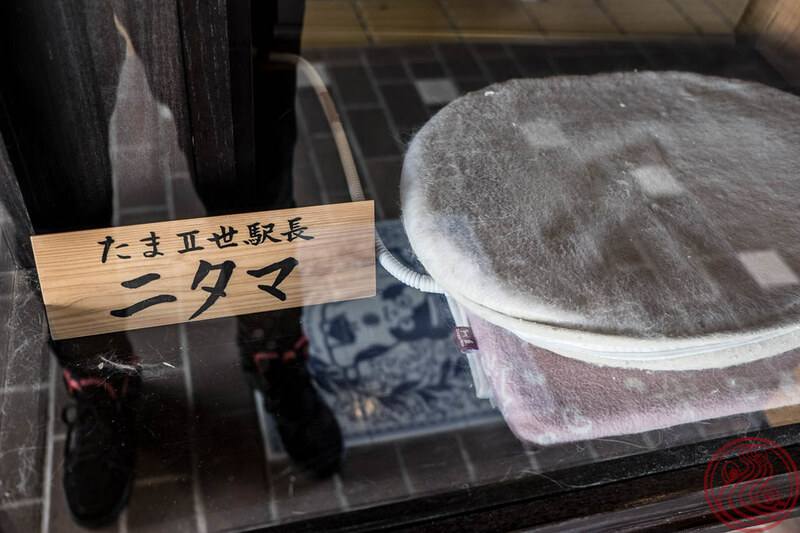 I don't know any shops in Tokyo that do this style well, apart from some limited bowls that appear who knows when. 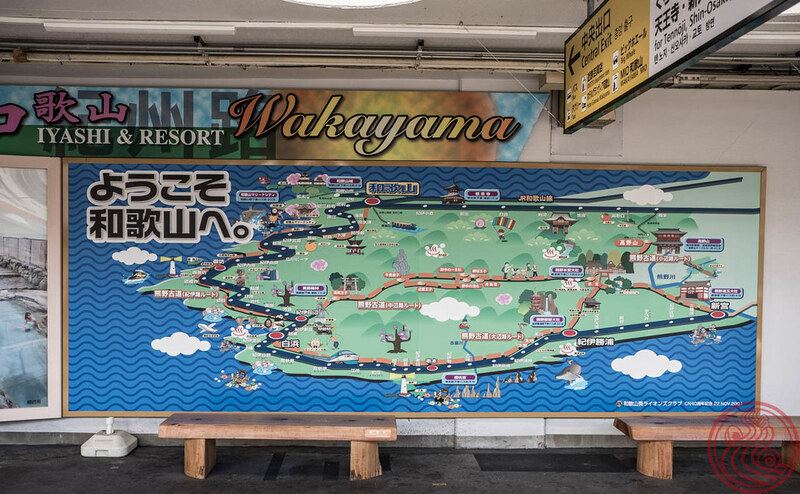 To get to the next ramen shop, it would either be nearly 2 hours by train, heading back to Wakayama and then taking a smaller line back out, or a short taxi ride south. Taxi it is. He even knew the exact spot when I mentioned ramen and Kanrojimae Station. Again with the Wakayama style. The shoyu taste in this one was on the deeper side, as was the shoyu flavor of the chashu. Today's recommendations come from my friend Tsukasa, a ramen nerd who eats 1000 bowls a year. He knows his stuff. This shop is close to the terminal of the Wakayama Kishigawa line, Kishi Station. But Kishi Station has another name, Tama Station. 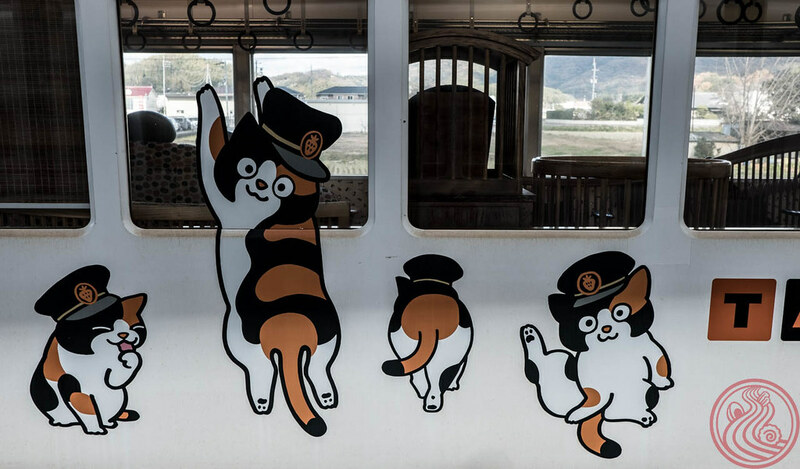 Tama Station is named after, yes, a cat. In 2006, the entire train line was in financial trouble. They de-staffed their stations, having local business owners handle some of the day-to-day duties. 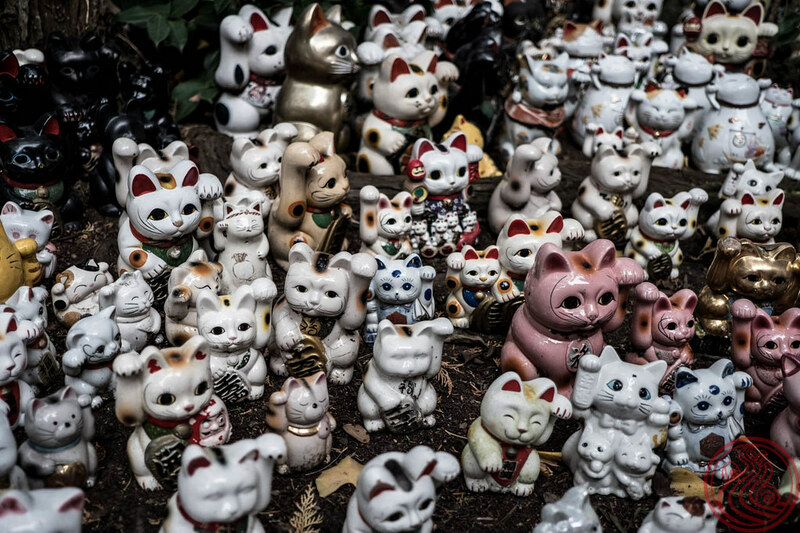 One such person, Toshiko Koyama, was fond of feeding a pack of local stray cats that gathered in the area. 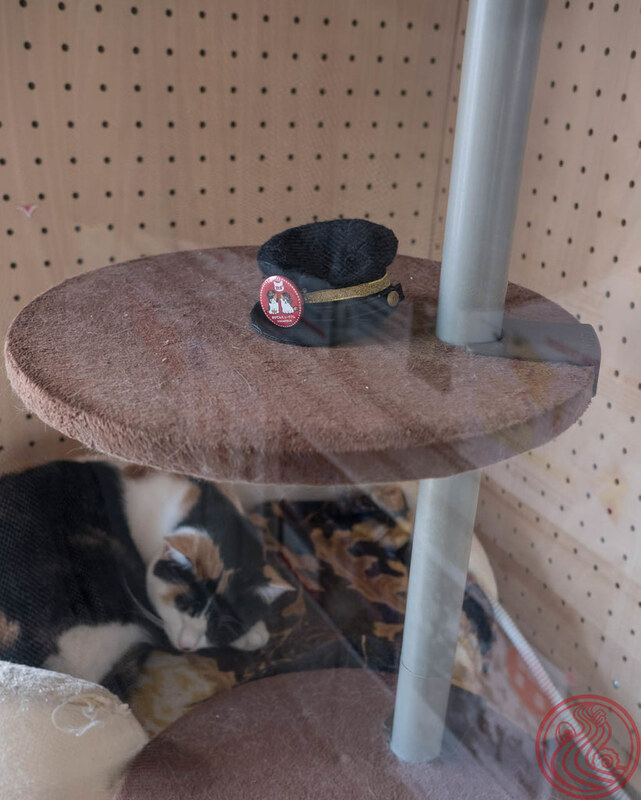 Tama, one of those stray cats, began spending a lot of time here, and in 2007 was named as the station master, eventually rising to the rank of Super Station Master. The hype brought in tourism (mostly young girls my taxi driver informed me). 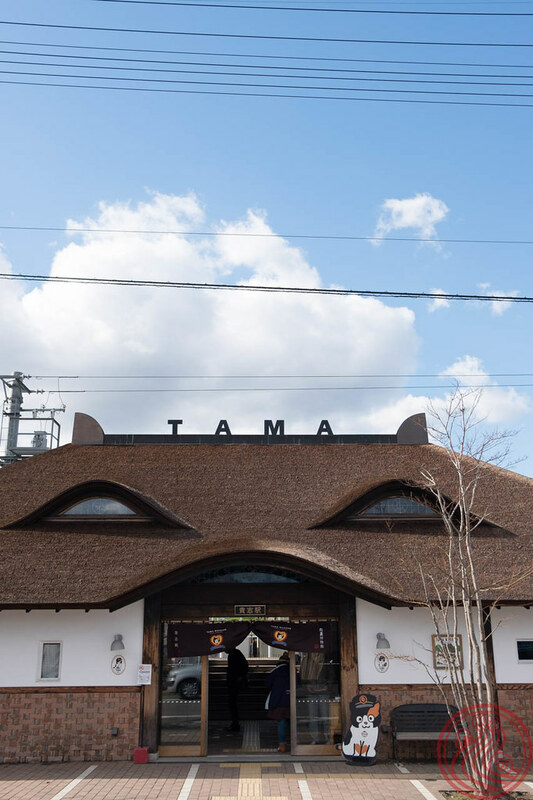 The station now houses a cafe, a little museum, and a shrine dedicated to Tama, who passed away in 2015. Tama's successor, Nitama, now has stationmaster duties. But, like any hard worker, Nitama has some days off. 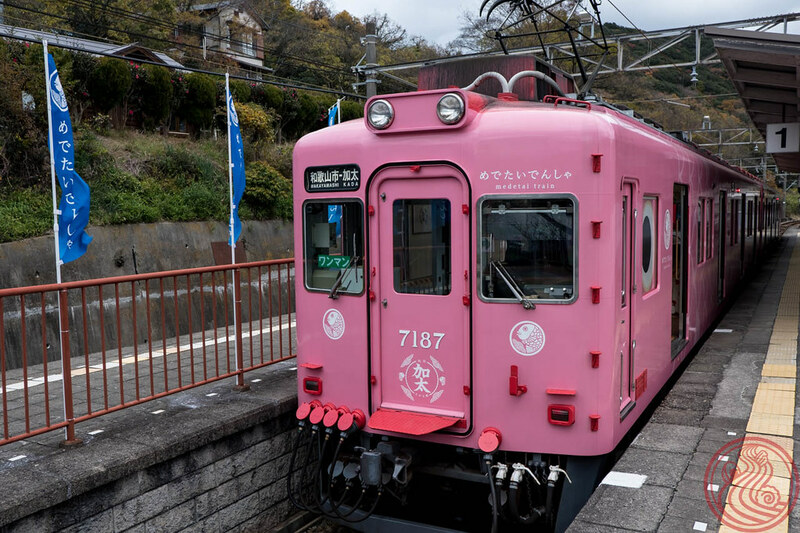 With the main use of this railway now being for tourism, the company took things further and made a four custom trains; themed after strawberries, Tama, umeboshi, and toys. Very cute. There were, even on a weekday, quite a few train otaku riding and taking photos. 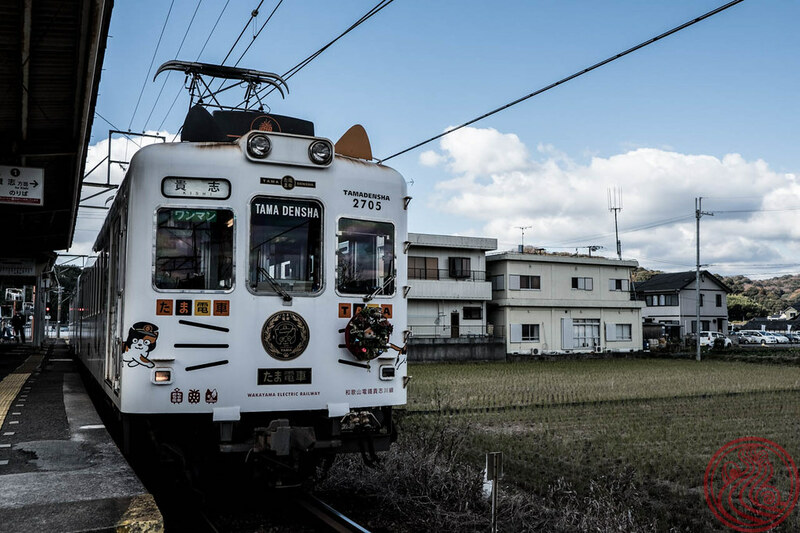 The Tama train, named after Super Station Master Tama. Remember how Nitama is off a few days a week? On those days, you can find Yontama at Idakiso Station, on the way back to Wakayama. For something like 800 yen, you can get a 1-day pass for this line, and explore the local spots. Trains run surprisingly frequent, so feel free to jump off to see what is around. 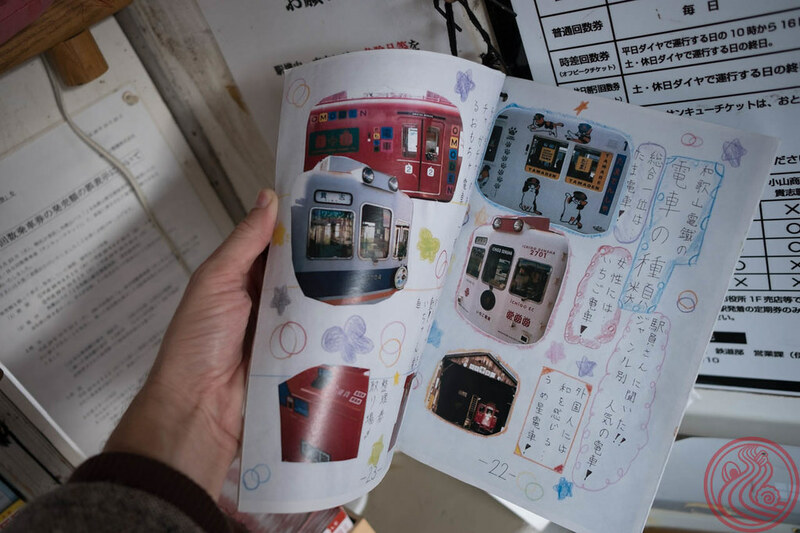 At Idakiso Station some local schoolchildren wrote a guidebook to the area. 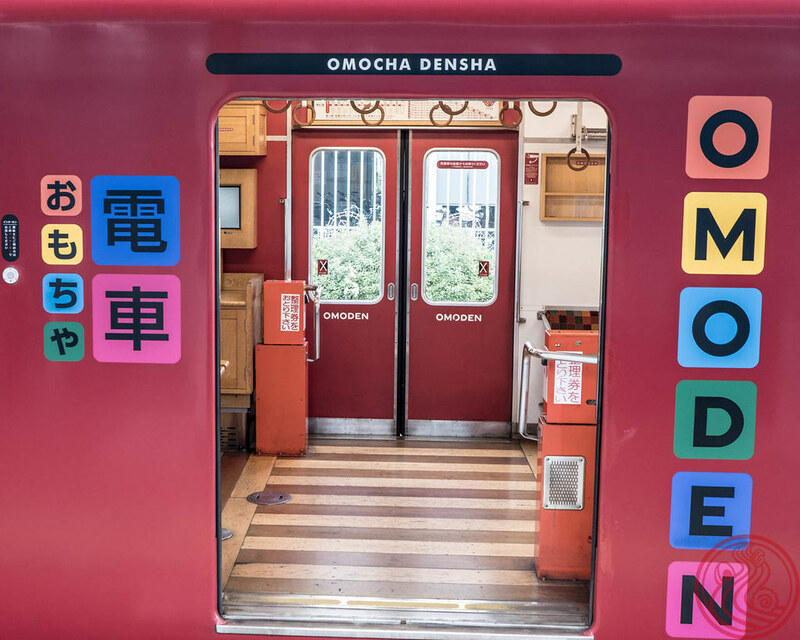 The Omocha Densha, or Omoden, is that toy themed train. Again, cute. 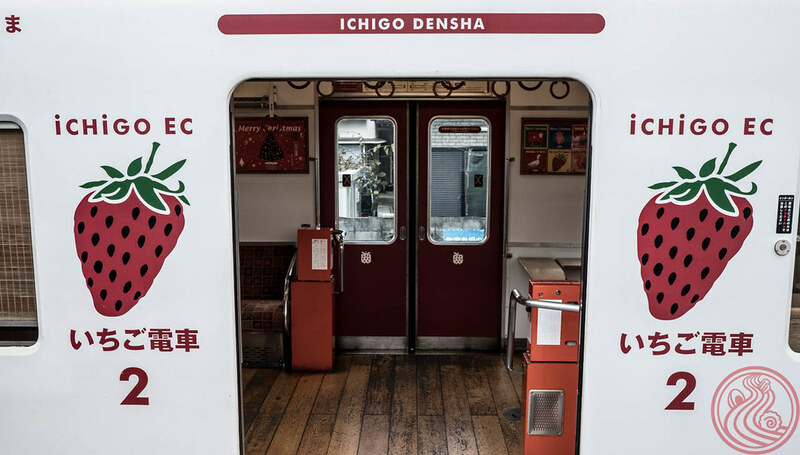 I was informed by some train photography nerds that the umeboshi train only runs on Sundays. Back in town with just enough time to wander around the downtown ぶらくり丁 Burakuri-cho shopping street. 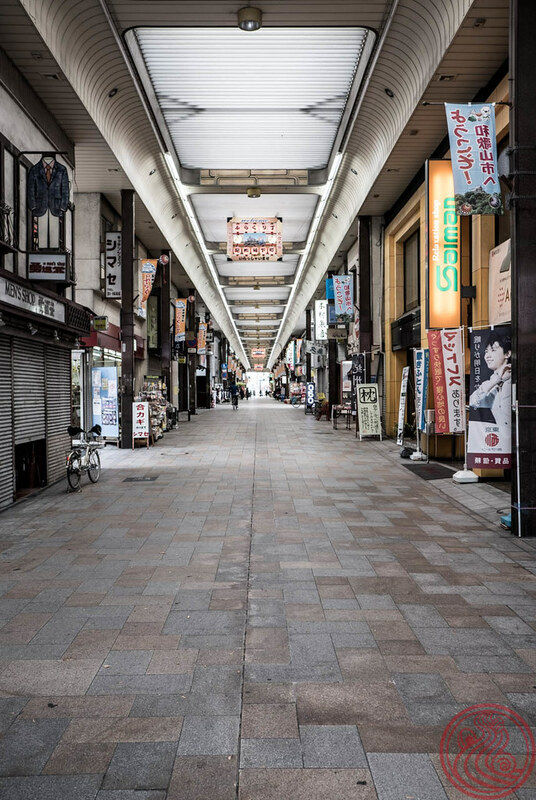 These covered shopping arcades are everywhere in Japan, and they all have a sort of nostalgic feeling. Fruit shops, old lady fashion stores, and completely random cafes (there was one dedicated to X Japan, a famous rock group). I found an English guide to the shops here. It was a quick two days, and I was back in Tokyo that evening. From Kansai Airport (KIX) it is only 40 minutes by highway bus. 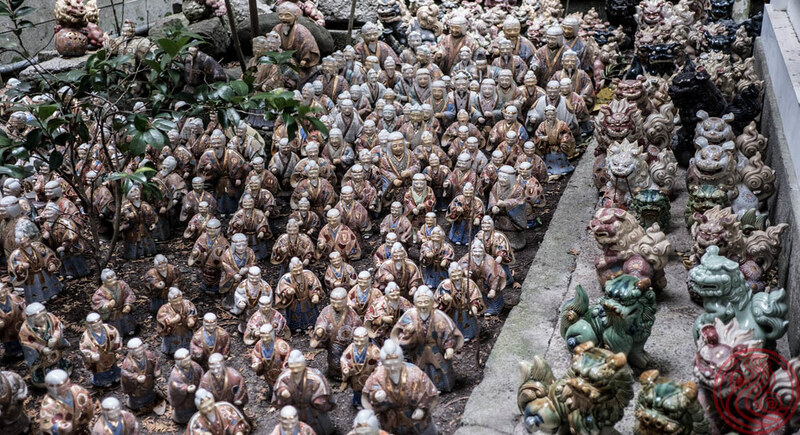 For most people I would suggest an overnight trip from Osaka down to Wakayama, with maybe another day spent up at Koya-san, a famous mountain covered with Buddhist temples. 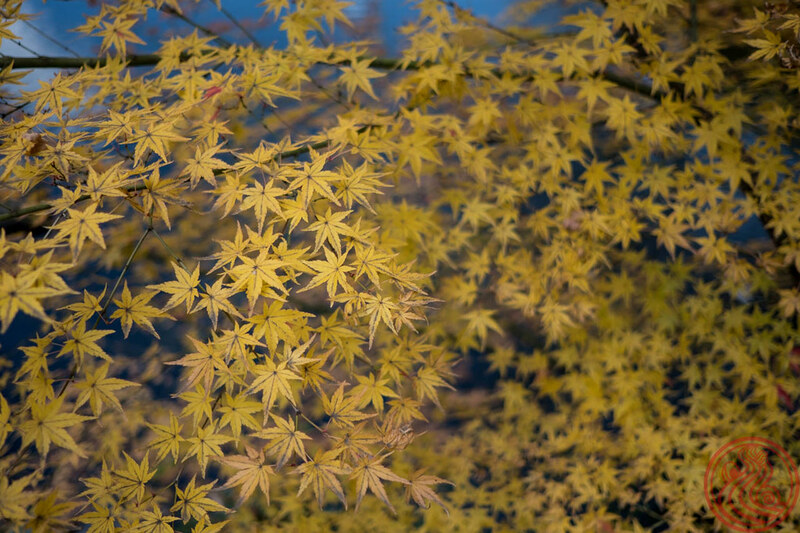 You could even stop off at Sakai for a few hours on the way to or from Osaka. For travelers from Tokyo, there are often super cheap flights from Haneda, sometimes as low as 10,000 yen round trip. Thank you to My Secret Wakayama for inviting me to the city this time. Check out their site for travel info, and stay tuned for my full ramen reviews of the five shops I managed to eat at. I still have one more ramen shop in Wakayama on my list, but it is the hardest shop in Japan to go to. ラーメン倉庫 is only open on Sundays, only for a few hours, and only during February and March. Insane, but I'm really hoping to go in 2018.